As travel changed, so did luggage. That’s the story told by an elaborate exhibition about Louis Vuitton, the luxury luggage and fashion brand. The Louis Vuitton exhibition. Image from AP. The exhibition, free to visit and on display in Lower Manhattan through 7 January, is called Volez, Voguez, Voyagez, which means fly, sail, travel. It showcases the company’s history, products and craftsmanship, demonstrating how designs changed with the evolution of travel. Luggage was designed first for transport by wagon, then for travel by sea, on trains, in cars and planes. There’s even a room where human artisans show how they cut leather and snip threads for luggage tags and handles, living proof of the craftsmanship behind the brand. The company’s history begins with Louis Vuitton himself. He started a trunk-making business in Paris in 1854 after leaving his village in eastern France and working for a box-maker. His designs were strong but light, distinguished by patterned motifs. The luggage has been a favorite of the rich and famous going back to Napoleon’s wife Empress Eugenie, with later clients ranging from artist Henri Matisse to banker J.P. Morgan. John Wanamaker began to sell Vuitton luggage in his American department stores after meeting Louis’ son at the 1893 Chicago World’s Fair. The brand remains a favorite today among celebs from the worlds of fashion and Hollywood. The exhibition’s timing coincides with the holiday shopping season, and the location is in New York’s financial district. 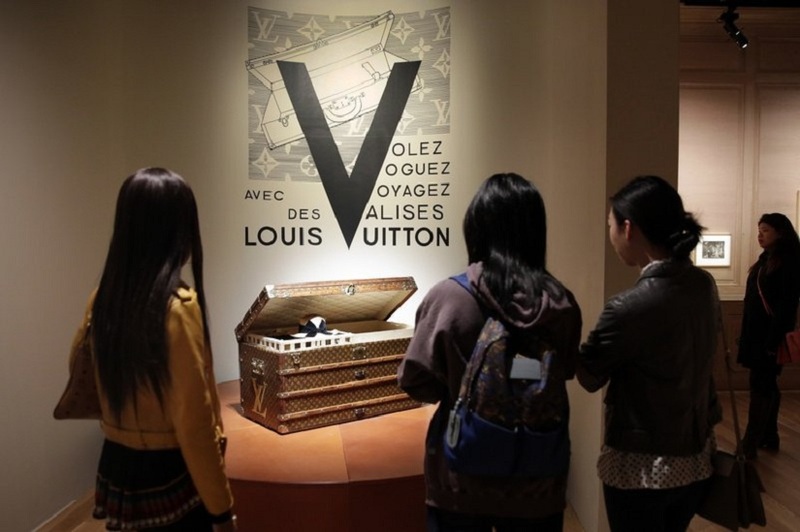 But most visitors will likely lack the means to buy Vuitton products, which can run in the thousands of dollars. Still, attention-getting temporary displays like this are becoming a standard way for brands to tell their story. Exhibitions also give designers the space and flexibility to fine-tune their message. In this case, the subdued, museum-like atmosphere creates a “mood that reflects the brand, somewhat elegant and somewhat understated,” he said. Pace University’s Manhattan campus is near the exhibition site, and Chiagouris said his students have been buzzing about the Vuitton show. They’re working on a competition among business schools to come up with a campaign for Ocean Spray, the cranberry brand, and the concept of telling a company’s story this way, through history, products and workmanship, resonated with them.